From time to time I will write about life, art, and the things that spark my imagination. And, just in case you were wondering, I’m completely drawn to time-worn elements, theater, dance, music, flowers, and books. I’m captivated with the portrait and the challenge of this subject. I aspire to weave these elements together into my art and reveal who I am. This piece is called Crepe Myrtle and hangs in our kitchen where I can see it everyday. 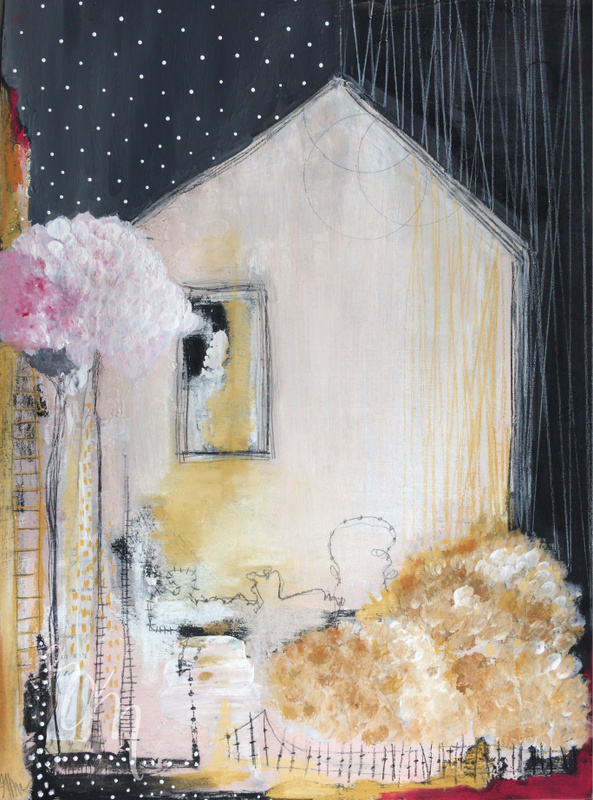 It is inspired by beautiful memories of my grandparent's home in Metairie, Louisiana. It represents love, joy, creativity, summer, freedom, fun, a lot of food and most importantly, my family. It is the perfect piece to welcome you to my creative home. I have been thinking about starting a blog for sometime now, however, much like opening a brand new sketchbook and making that first mark upon a stark white page, starting a blog is a bit daunting. With so many beautiful blogs floating around in "beautiful blog world" I decided that the only thing I can do is to be me. Really me! Real art is made from a place of honesty and it is my pledge to share it all with you. I'm a mom, wife, artist, dance teacher, car pool driver, snack maker, library volunteer, book lover and all round romantic - I probably left a few things out, but I'm sure they will emerge as time goes on. I would like this to be a place where I share what works, what doesn't work and what inspire me to create art. I will share my techniques, my creative practices and my process with you. I have some fun plans in the works. Very soon I will be launching a beautiful (FREE) art journaling class that will give you suggestions for gathering ideas, creating beautiful journal pages and suggestions on how to create a meaningful art practice. I will share many of my tips and techniques along with how I generate ideas for larger works through art journaling. And, in January 2018, I will release my first online art class, Full Bloom, this course will dive deeper into creative practices so you can make art that is truly unique to you. I welcome you to join me as I practice, share ideas and follow inspiration down the rabbit hole. Whether you are just beginning or just need a new perspective this will be a very nurturing place for all creative souls. 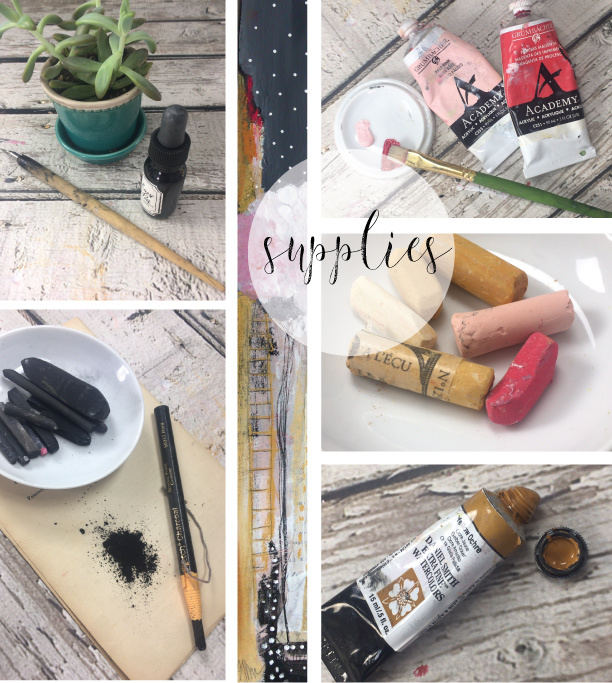 Above are the supplies that I used in making of the mix media piece, Crepe Mrytle: Ink, watercolors, acrylics, charcoal, pastels and white gesso. I can't live without gesso! Subscribe to the mailing list and be the first to receive news of free classes and early registration prices for online classes. Your email will remain private. ©Renee Mueller. All images and content are the property of Renee Mueller and cannot be used without prior written consent. Thank you.